Eeyou Istchee can be divided into distinct sub-regions in terms of impacts from industrial development. Below the northern limit for commercial forestry, the majority of the landscape has already been transformed by forestry, roads, and mining activity. In this sub-region, the principle approach taken for conservation planning is to focus on protecting “what’s left” (areas that remain intact or undisturbed by industrial activities) and areas of high cultural importance. Above the commercial forestry limit, the situation is quite different. This more northern part of Eeyou Istchee has been very heavily impacted by hydroelectric development and by some mining related development, however in much of the northern portion there still exist the opportunity to build a conservation areas network focused on “the best” in terms of key habitats, ecosystems and areas for maintaining cultural and ecological integrity. This strategy will be implemented as a whole, both above and below the commercial forestry limit. However particular attention will be given to areas where the development pressures are high, in order to try to achieve some balance in conservation and development goals before the opportunity to do so slips away. There are three key scales for conservation areas planning in Eeyou Istchee: the trapline (or family hunting areas), the community level and the regional level. The planning of a conservation and protected areas network requires that work at all three of these levels is coordinated. Most Cree decisions related to conservation currently take place at the trapline level, given the central role of the tallymen and the Cree trapline management system. The trapline management system provides the foundation upon which the Conservation Strategy can be built. Several parks and protected areas projects in Eeyou Istchee have resulted from collective initiatives at the community level, with the support of the tallymen and the local Cree communities. These Cree led trapline and community level protected area and conservation initiatives can be seen as the building blocks of a regional conservation areas network. 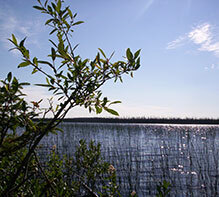 The regional “big picture” planning scale is critical to ensure that the conservation areas network covers the whole of Eeyou Istchee, and that the goals of large intact areas, connectivity, ecosystem processes and species habitats are maintained across the region in a way that works as a whole. Achieving this requires regional leadership and coordination in conservation, which will be achieved through the implementation of this Strategy. Eeyou Istchee is located mainly in the Hudson Bay Drainage basin. There are roughly a dozen watersheds within Eeyou Istchee. Using a watershed based planning approach provides an interesting option for the Cree Conservation Strategy, as it a way to managed the wellbeing of the ecosystems for both conservation and development planning. As mentioned above, many administrative boundaries have been superimposed on Eeyou Istchee. The region is not limited to the land but also extends out to encompass significant marine areas. These boundaries create some jurisdictional complexities for achieving our conservation goals. However the establishment and maintenance of good relations with our neighbors and other parties can allow us to achieve common trans-boundary conservation objectives. Effective partnerships and collaborations will be built to facilitate the coordinated and effective implementation of this Strategy. 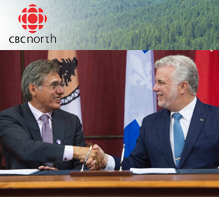 In particular, collaboration with public governments (such as the Québec Government, the Eeyou-James Bay Regional Government and the Kativik Regional Government), Environmental Non-Governmental Organizations (ENGOs), academic institutions and researchers, and other stakeholders will be encouraged.